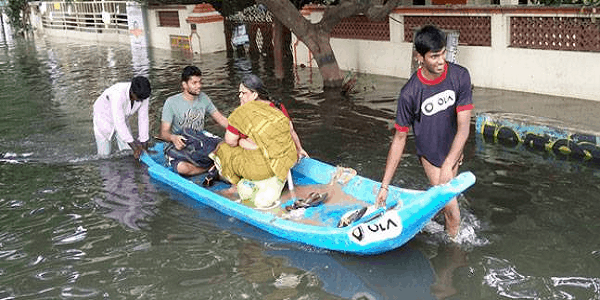 First in the country, online taxi aggregator Ola has started a temporary boat service in the southern Indian city of Chennai, where heavy flooding has turned streets into waterways. The heavy rains resulted in water logging in a significant portion of the city. Thousands of individuals are stranded because of the heavy rains being experienced by Chennai over the last couple of days and the citizens in great turmoil. Ola is offering ferry services with professional rowers manning the boats that are ferrying about 5-9 passengers in a single trip. The boats will also be used to provide food and drinking water in specific areas which are reportedly short of basic supplies. Both ferrying services and supplies will be offered free of cost to citizens. Ola is also providing rain gear to all rowers, which will help them ferry people without any hassles. The boats also have umbrellas on-board to help comfort the passengers. Rescue operations are being conducted based on data sourced from the Fire and Rescue Department. “Thousands of citizens have been stranded and are suffering due to heavy rains and water logging in Chennai,” said Ravi Teja, business head of Tamil Nadu at Ola. “Boats deployed by Ola will help ferry people to safer areas and in distribution of essential supplies like food and drinking water in affected areas,” he added. The company said that the services will be available over the next three days and may be extended depending on how long the waters take to recede.